The other day I had an itching to make bread again so I thought I’d make something with what we had on hand (which to be honest isn’t much!). 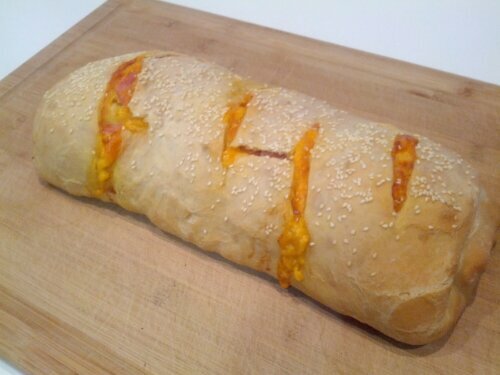 My chicken parmesan stuffed bread was a hit so I thought I’d do something similar. 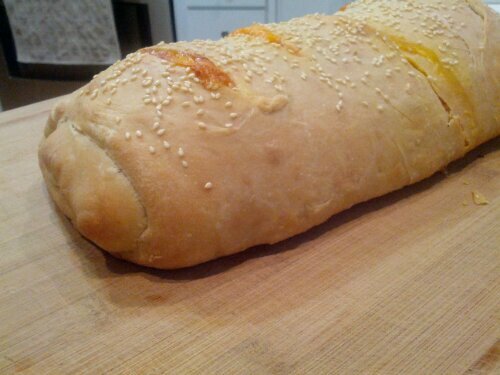 I decided on a stuffed ham & cheese bread but instead of braiding the top like I did with the chicken parm bread, I decided I would roll this one like you do cinnamon swirl bread so there would be layers of bread, ham & cheese swirled throughout. BTW, I finally figured out how to score the bread… Best to use a razor blade. My knives (serrated or not, always stick to my dough and make a mess – more of an indent than a score). The razor blade worked like a charm!